When we picture weddings, it is usually the same procession of people down the aisle, including a flower girl and a ring bearer. Normally, the last two positions are filled by young family members or children of close friends. However, some people have someone else in their life who is exceptionally important. This "person" makes every day better and your wedding would just not be the same without them. This "person" is, of course, your dog. Having your dog be your ring bearer can, of course, raise a few issues and it is important to keep these in mind so that you can get hitched without a hitch! 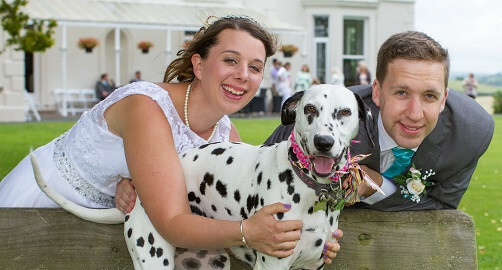 Firstly, make sure the place you are holding the ceremony allows pets! Sadly, dogs are not welcome everywhere, so this is a very important issue to address. Churches may not allow your dog, some beaches may not, and some public parks may not so be sure to pick a venue that is dog-friendly. Secondly, make sure your dog can handle going down the aisle. If you have an exceptionally well-trained dog, then by all means, run your dog through the routine a few times and let him at it. However, if your dog has some behavioral problems, or is just a little distractable, make sure you have someone who can walk down the aisle with your pet. You could even use a young member of your family here. Another tip? If your dog is the excitable type, consider using fake rings, at least for going down the aisle with. Hold onto your rings yourselves (or have a member of your entourage do it). Then, once the dog has arrived, surreptitiously switch the rings out. If you are going to give your dog the real rings, make sure they are very well secured. Lastly, if you want to, consider putting the rings in a decorative ball or at the ends of a bedazzled stick. Have your dog walk this up the aisle to you for a cute twist on the traditional ring bearer.